Can a 4X Fit Into an Eloquii Plus Size 24? Well, Yes, Sometimes! You may know that Eloquii relaunched their line in February, and I agree with many other plus size fatshion mavens that the new look is much more luxe and fun and trendy. BUT, their largest size is a 24, and I really wear a size 26/28. 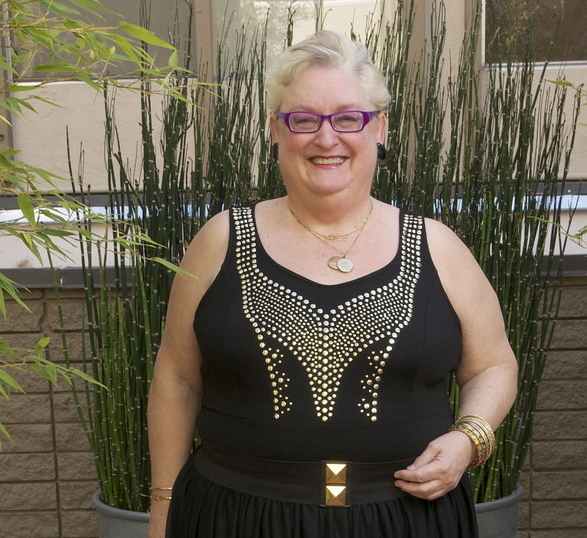 I decided I would take a chance and see how Eloquii’s sizes run, so I ordered a studded top. It fit fine, partially because there happened to be a little stretch, and I loved that the armholes fit, because they often run large on me. I will try Eloquii again, but I doubt you will see me in a pencil skirt, or bodycon dress from their line. This entry was posted in How Does It Fit?, Online Plus Size fashion and tagged Eloquii review by affatshionista. Bookmark the permalink. Love the top on you fits really well. !! Love that tank. It fits you well. That does look lovely! I’m a bit disappointed withe the Eloquii quality this time around and find the bottoms a bit small (tried 3 pieces). Some interesting pieces though and this look is a smash – I might have to go back and get this top! Thanks for commenting! My pleasure! That top suits you well! Thanks, I was pleasantly surprised by how well it fit.